One young Campbell River hockey player – and fan – recently had a very, very good day down in Anaheim. 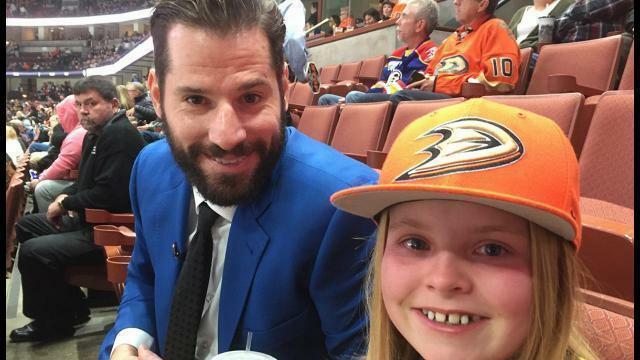 Mackinley Whalen, 11, picked up on Ryan Kesler when he was a Vancouver Canuck. She wasn’t really a fan of the team – her parents are both Montreal Canadiens fans, after all – but she certainly did like “that number 17 guy,” she says, and when he was traded to Anaheim, her fandom followed. “If he was traded to Toronto, I’d probably be a Leafs fan,” she says. “No you wouldn’t,” interrupts her mom April, half-jokingly. So when Kesler went down with injury earlier this season, she decided to write him a letter wishing him a speedy recovery and letting him know they were going to be down that way with tickets to a pair of games. The letter included her seat number for each game. Apparently, April had added her cell number to the letter before it was sent, because she got a text message from Kesler letting them know he planned on joining them during the Ducks/Predators game Nov. 3. She didn’t tell Mackinley, though, because she thought it would be better as a surprise. The Whalen’s go down to the U.S. fairly frequently to watch hockey, because it’s actually significantly less expensive than going over for a game in Vancouver. And while they’re down there watching hockey, they can see some other things, as well. Mckinley is quite the athlete herself. She plays for two local hockey teams – one mixed and one girls’ team – as well as being as burgeoning golfer. She is currently enrolled in a golf academy in Parksville with hopes to maybe one day become a professional golfer.